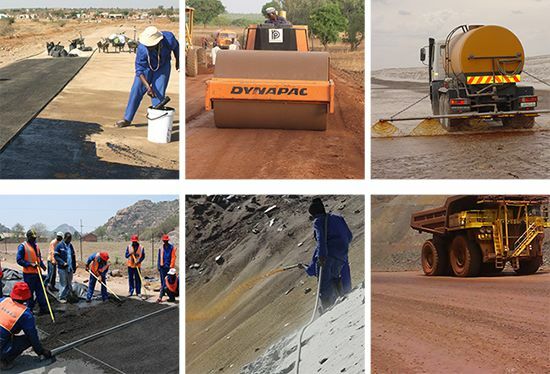 Established in 1986, Road Material Stabilisers (Pty) Ltd specialises in the supply of a broad range of soil stabilisers, binders and numerous dust palliatives to the civil engineering and construction industry as well as the formal mining sector. This introduction is not intended as a detailed explanation but merely serves to give a fundamental understanding of ISS and the effect it has on a large number of soil types. Sasbind is a uniquely formulated water based emulsion of modified acrylic polymers suitable for the binding and stabilisation of layers for use in construction of al types of roads. Sasbind provides a strong gluing and waterproofing action on soil particles and is suitable for application to a wide variety of soil types. Dustex gravel preserver and dust palliative is a uniquely formulated lignin-based product available in both liquid and powder form. With the ability to penetrate almost any standard compacted road surface, Dustex produces a well bonded smooth hard surface with good abrasion resistant characteristics.